ICPRB’s efforts in restoring and protecting the watershed’s resources are aided by a highly educated and qualified staff of scientists, administrators, and communications professionals, many with advanced degrees. The technical ability of the ICPRB staff in watershed and related resources management is recognized throughout the region. This expertise supports a variety of actions by the ICPRB member jurisdictions in a number of areas of interest. The focus on water resources spans a range of activities, including managing the river for water supply during droughts, forecasts of demand, flood control, and source water protection. The water resources knowledge of the staff through the ICPRB Section for Cooperative Water Supply Operations on the Potomac (CO-OP) coordinates the water supply withdrawals of the three major metropolitan-area water utilities that rely on Potomac River water for over 400 million gallons per day to meet the thirst of the capital region. The unit conducts research to support future water supply needs of the metropolitan area, and studies how the existing system can be improved. Water resources staff coordinate a basin-wide Drinking Water Source Protection Partnership (DWSPP) that brings local, state, and federal groups together to protect drinking water supplies for the watershed. Staff also are working to determine groundwater uses and needs throughout the basin. Water quality issues addressed by Commission staff include supporting highly complex studies and project developments that reap benefits both for the Potomac basin and for the Chesapeake Bay drainage. Commission participation as a partner in the bay recovery aims at restoring living resources, striving to improve productivity of the ecosystem, and ensuring its vitality as a place to live, work, and recreate. Some staff members in this section work exclusively on projects with the Chesapeake Bay Program. Staff in the aquatic life section of ICPRB work to evaluate and report on biological communities and how they respond to stream, river and estuarine conditions. 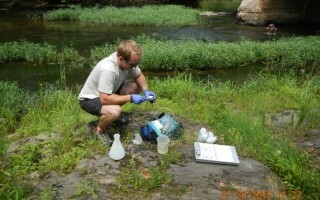 Staff carefully measure and analyze aquatic life data in the Potomac basin and make management recommendations based on sound scientific data. Working collaboratively with other organizations, staff develop ecosystem indicators and analysis that is consistent basin-wide. Work in the Water Quality and Aquatic Life sections includes: Survey water quality, filamentous algae, macroinvertebrates, fish, and other biota in streams and large rivers; Compile and manage databases of water quality and biological monitoring data; Model watersheds and their impacts on streamflow, water quality, pollutant transport, and aquatic life; Develop regional indices of biotic integrity (IBIs) for stream macroinvertebrates and tidal phytoplankton; Use IBIs and biological indicators to inform development of restoration goals and water quality standards; and Prepare Total Maximum Daily Loads (TMDLs) analyses and reports. The agency’s technical expertise is magnified by a communications program that extends the impacts and results of these and other projects to the region’s public. Work in protecting and improving the region’s resources can be effective only when the public is educated about the reasons for those actions, and their role in the preservation of those resources.